Monday 22nd April 2019, 10:00 am. 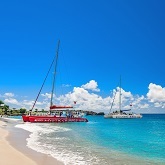 Book the Sail and Snorkel Tour aboard Mystic out of Jolly Harbour on Mondays from 10am - 3pm. The tour includes snorkeling at Cades Reef, lunch, open bar and sailing & beach breaks. Cost: US$80 for adults and specials are available for kids. You must provide your own transportation to and from Jolly Harbour. For reservations or more info call tel: (268) 736-7460 or (268) 480-1225.